The first building built on this site was the Harris Tavern, established by Dr. John Washington Harris. It become a stagecoach stop in the 1830's. In 1866 Harris Tavern became the Logan House after being purchased by Judge George W. Logan. Subsequently leased in 1877 by James M. Flack. Two events devastated the Logan House, first the Great Flood of 1916 and later a fire in March 1930. The fire started in the village of Chimney Rock and destroyed nine buildings, The Logan House being one of the greatest losses. The Logan House was rebuilt in August 1930. Over the years there have been several other owners and many renovations. In March 2002, Larry and Carol Lane became the proud owners of this historic Inn. They made the downstairs into a quaint retail shop called Fibber MaGee's while renting out the rooms upstairs. In November of 2017 we, (Brian & Rhonda Hillabush ) purchased Fibber Magee's Riverfront Lodging and Mini-Golf and turned it into the Broad River Inn, Coffee Shop, Cocktail Lounge and Chimney Rock Adventure Golf. We have owned several businesses over the years and raised our family in the Seattle, WA area. 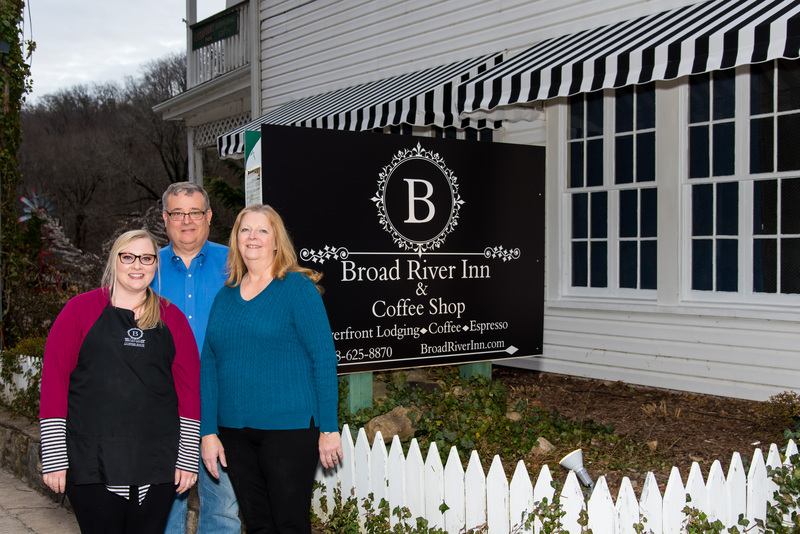 We brought our daughter, Ali along with us, with her love of coffee to open the Broad River Coffee Shop. We have been working feverishly to restore and remodel the Inn and give it a touch of elegance while keeping a warm, inviting feel. Our beautiful lobby is the perfect place to display the work of local artists, enjoy a cup of coffee, surf the net and meet new friends. You'll come as visitors, but leave as friends. All accommodation rates in the Inn are for double occupancy. All rooms and common areas include free high speed wireless internet access and boosted cell service. Complimentary Made to Order Breakfast each morning between 8:00am – 10:00am that can be delivered to your room or enjoyed in our lovely dining room. Breakfast includes your choice of eggs (any style), Bacon or Sausage, Hash browns or grits, Toast, French Toast, cereal or oatmeal, juice and coffee. All accommodations are non smoking.